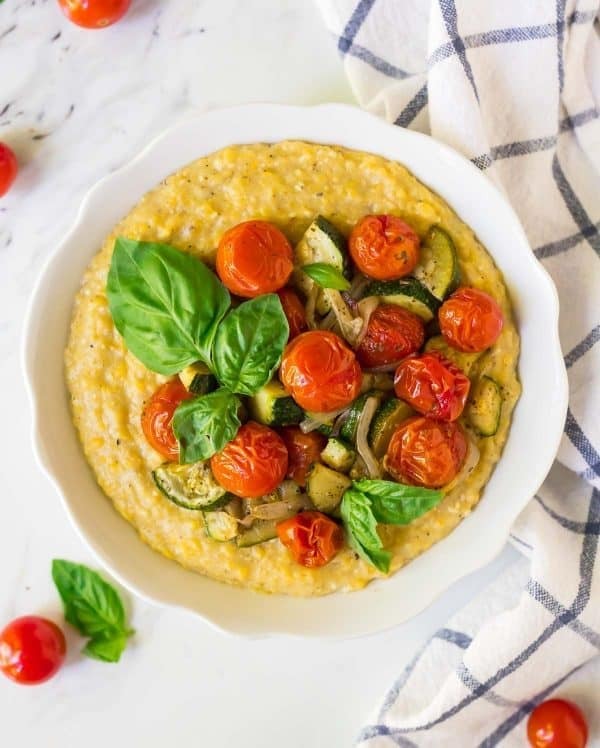 This Creamy Polenta with Roasted Zucchini and Tomatoes is the humble majesty I love about summer. Despite its understated ingredient line up, it manages to be stunning and satisfying. Lately, every time I walk through the grocery store or hear an update about a friend’s garden, I’m in awe of the abundance of colors and flavors that burst from the earth this time of year. Summer ingredients demand little from us as home cooks, yet their rewards are great. It’s as if summer is showing off by not showing off. I’ve been stockpiling our kitchen with zucchini and tomatoes lately, the result of being a seasonally-obsessed bargain shopper who can’t resist a pretty piece of produce or a good deal. Zucchini and tomatoes offer both. 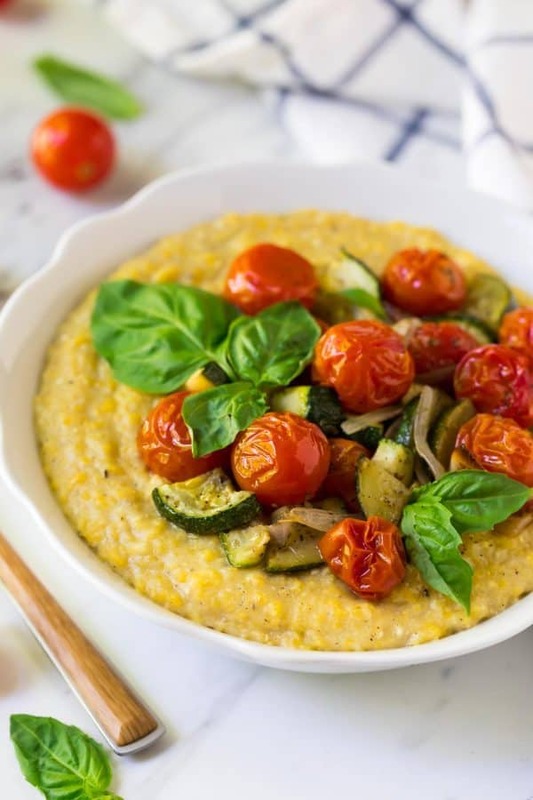 Last week, I was in the mood to try something new with my latest vegetable buy, when I spied an ingredient on my shelf that, like zucchini and tomatoes, is unpretentious in every way but can be served up as something extraordinary: polenta. Polenta is coarse-ground cornmeal that, when cooked properly, transforms into the dinner equivalent of a soul-affirming bear hug. Polenta is lusciously creamy, warm, and every time I eat it, it surprises me anew with just how fulfilling and delicious something as simple as ground corn can be. If your feelings towards polenta aren’t warm and fuzzy like mine (do the words lumpy and bland come to mind? ), I’m willing to bet my last summer tomato that you haven’t had it cooked properly yet. This creamy polenta recipe will change your mind. If your feelings towards polenta are warm and fuzzy, but you perceive polenta as a heavier indulgence meant only for now and then, this recipe will change your mind about that too. I’ve kept the creamy texture and the comforting feel that makes polenta its marvelous self, but lightened up the recipe with a few easy tweaks. Perfect, Creamy Polenta, PART ONE: Stir. Pour the polenta into the pot sloooooowly, then stir, stir, stir. You don’t need to knock your arm off, but you don’t want to walk away either. This part takes 5 to 10 minutes, that’s all! Turn on a podcast, call your grandma, or dance to a little Taylor Swift while you wait. The time will be up before you know it. Perfect, Creamy Polenta, PART TWO: Mind Your Cooking Liquid. Traditional polenta recipes call for cooking the polenta in either chicken broth or water, then stirring in something along the lines of heavy cream or a stick of butter (or both) at the end. 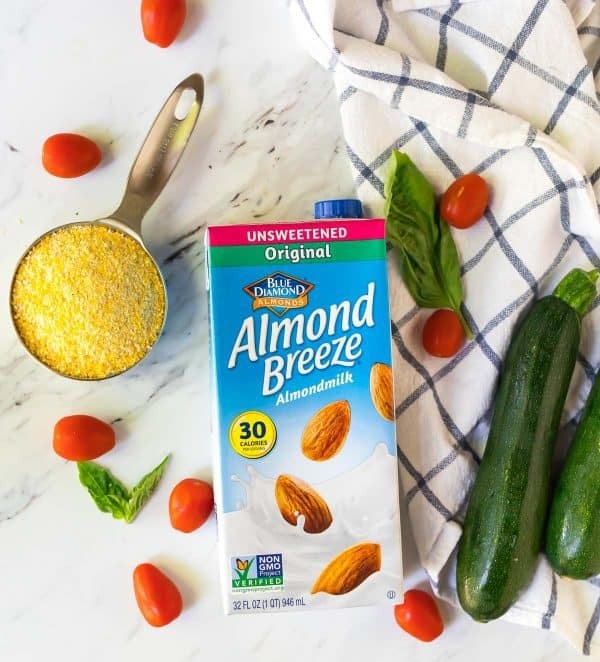 My trick to creating the same creamy feel without the cream is Almond Breeze almondmilk Original Unsweetened. Perfect, Creamy Polenta, PART THREE: The Finishing Touches. Now that we’ve nailed the creamy texture, let’s talk about the final flourishes that give creamy polenta its punch. Traditional polenta recipes usually call for stirring in Parmesan and butter at the end. Instead of doing the creamy polenta with cheese, I opted for nutritional yeast which is loaded with nutrients and tastes surprisingly “cheesy.” I regularly use it in place of Parmesan (especially in omelets and on roasted veggies), and you can use it in any one of these recipes with nutritional yeast too. No nutritional yeast on hand? Feel free to swap Parmesan or omit it. For the butter: use a little, not a lot. I found two tablespoons to be the right amount for the polenta to taste indulgent without feeling heavy or greasy. To make the polenta dairy free, swap a vegan butter alternative. Now, time to top the polenta off, summer veggie style! On its own, creamy polenta makes a wonderful side, but I wanted to extend it to a full meal, so I piled it high with roasted summer veggies. The combination of zucchini, tomatoes, and shallots was bright and exactly right for the season. I’m excited to try this creamy polenta with different sorts of vegetables as the summer goes on. In addition to roasted veggies, I think it would be delightful with grilled ones, and I can see it being paired with a fresh summer tomato sauce in place of pasta too. 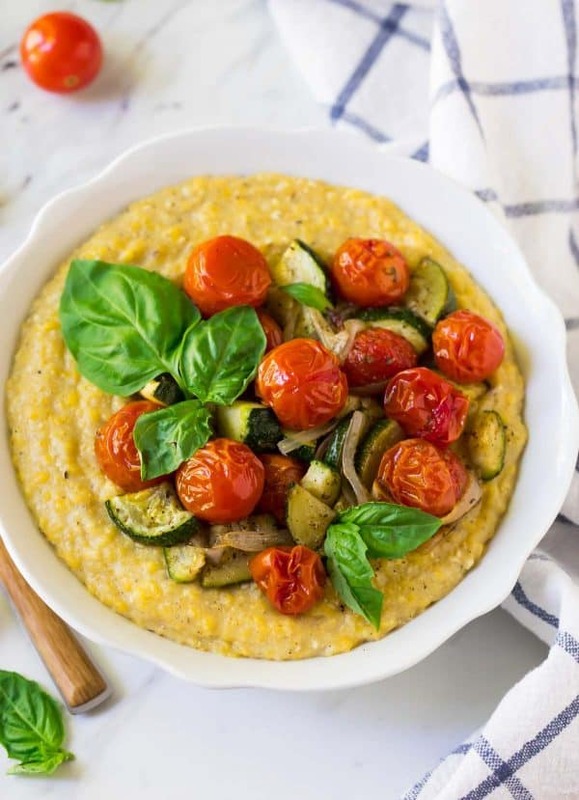 How to make vegan Creamy Polenta topped with roasted zucchini and tomato or any of your favorite veggies. Easy, healthy, and tastes rich and comforting! 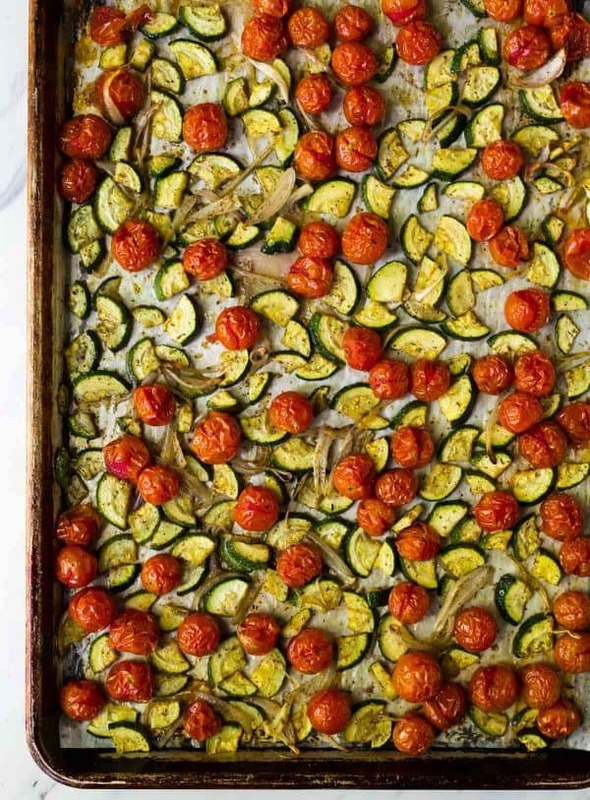 For the vegetables: Preheat the oven to 400 degrees F. For easy clean up, line a large, rimmed baking sheet with parchment paper. Place the grape tomatoes, chopped zucchini, shallot, oregano, and olive oil in a bowl, then drizzle with olive oil and sprinkle with salt and cracked black pepper. Toss to coat, then spread the vegetables mixture onto the prepared baking sheet. Roast for 30-35 minutes, or until the tomatoes burst and the shallots are crisp, tossing and spreading the vegetable back into a single layer twice throughout. Remove from the oven and set aside. While the vegetables roast, prepare the polenta: Combine the broth, almondmilk, and garlic in a large saucepan and bring to a boil over high heat. Reduce the heat to a simmer and very slowly whisk in the cornmeal, adding it in a very thin stream and whisking constantly to make sure there are no lumps. Switch to a wooden spoon and reduce the heat to medium. Add the salt and pepper. Simmer for 5-10 minutes, stirring almost constantly and scraping the bottom of the pan to prevent sticking, until the polenta thickened. The timing will vary based on the brand and type of polentayou use. Remove from the heat and stir in the nutritional yeast and butter. Taste and add additional salt, pepper, or nutritional yeast as desired. Store leftover polenta and vegetables separately in the refrigerator for up to 3 days. Rewarm the polenta gently on the stove with a splash of broth, water, or almondmilk to thin it as needed. Stir often, until heated through. Reheat the vegetables in a small skillet over medium heat or in a 350 degree F oven. This summer veggie polenta has my name ALL OVER IT! Thanks Shawnna! I hope you love the recipe if you try it! I am a polenta lover. Interesting idea using the nutritional yeast as a stir in, I’ve never tried that. I’ve actually not yet tried nutritional yeast, but my mom uses it all the time. Guess it’s time to check it out! This is the perfect recipe! I have all these fresh tomatoes in my fridge that I need to use and this is perfect! Danielle, it is so yummy and great in polenta! If you try this recipe, I hope you love it! I made this for dinner tonight. Really delicious! My husband liked it too. SO SO SOOO HAPPY to hear that Patty, thank you! We have been making this at least once a week since you posted it. Thanks for a keeper! SO SO pleased to hear it Bree, thank you!! !